Describe a straight-line graph in terms of its slope and y-intercept. 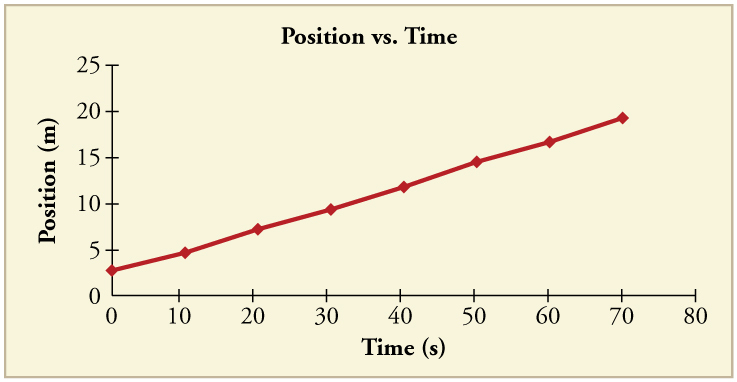 Determine average velocity or instantaneous velocity from a graph of position vs. time. 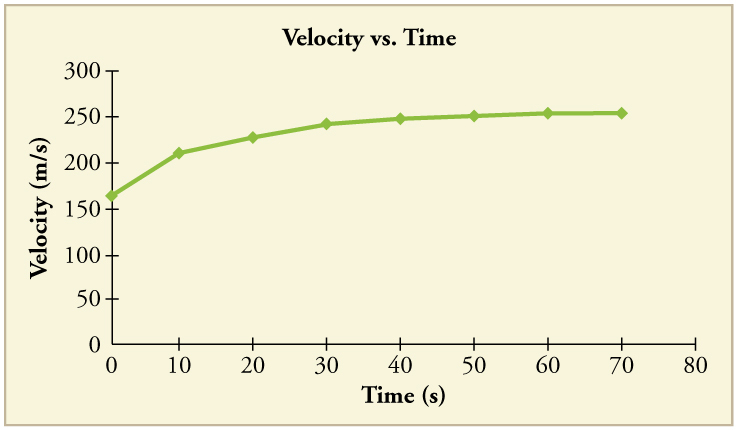 Determine average or instantaneous acceleration from a graph of velocity vs. time. 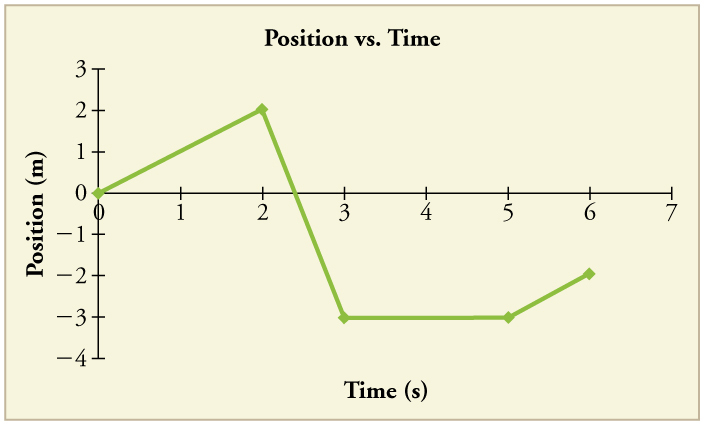 Derive a graph of velocity vs. time from a graph of position vs. time. 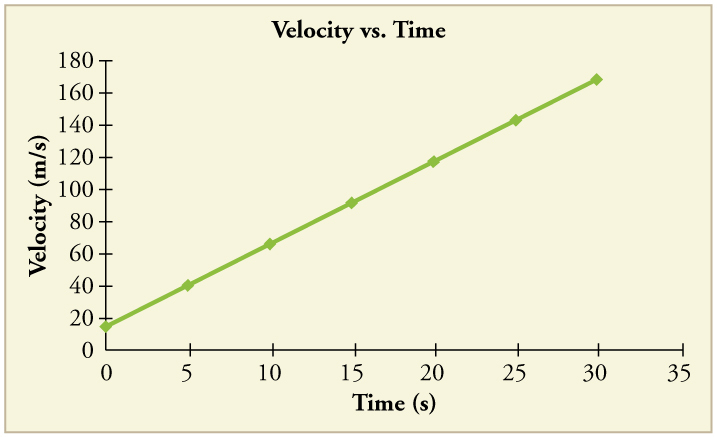 Derive a graph of acceleration vs. time from a graph of velocity vs. time. A graph, like a picture, is worth a thousand words. Graphs not only contain numerical information; they also reveal relationships between physical quantities. This section uses graphs of displacement, velocity, and acceleration versus time to illustrate one-dimensional kinematics. 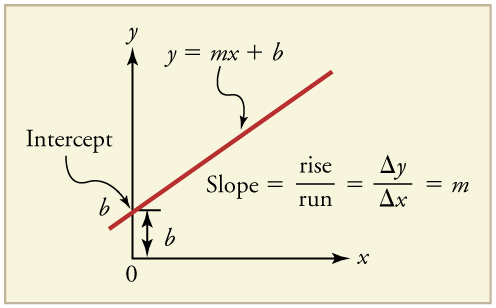 Here is the slope, defined to be the rise divided by the run (as seen in the figure) of the straight line. The letter is used for the y-intercept, which is the point at which the line crosses the vertical axis. Figure 1. A straight-line graph. The equation for a straight line is y = mx + b. Time is usually an independent variable that other quantities, such as displacement, depend upon. A graph of displacement versus time would, thus, have on the vertical axis and on the horizontal axis. Figure 2 is just such a straight-line graph. It shows a graph of displacement versus time for a jet-powered car on a very flat dry lake bed in Nevada. Figure 2. Graph of displacement versus time for a jet-powered car on the Bonneville Salt Flats. Thus a graph of displacement versus time gives a general relationship among displacement, velocity, and time, as well as giving detailed numerical information about a specific situation. Notice that this equation is the same as that derived algebraically from other motion equations in Chapter 2.5 Motion Equations for Constant Acceleration in One Dimension. From the figure we can see that the car has a displacement of 25 m at 0.50 s and 2000 m at 6.40 s. Its displacement at other times can be read from the graph; furthermore, information about its velocity and acceleration can also be obtained from the graph. Find the average velocity of the car whose position is graphed in Figure 2. 2. Substitute the and values of the chosen points into the equation. Remember in calculating change we always use final value minus initial value. This is an impressively large land speed (900 km/h, or about 560 mi/h): much greater than the typical highway speed limit of 60 mi/h (27 m/s or 96 km/h), but considerably shy of the record of 343 m/s (1234 km/h or 766 mi/h) set in 1997. 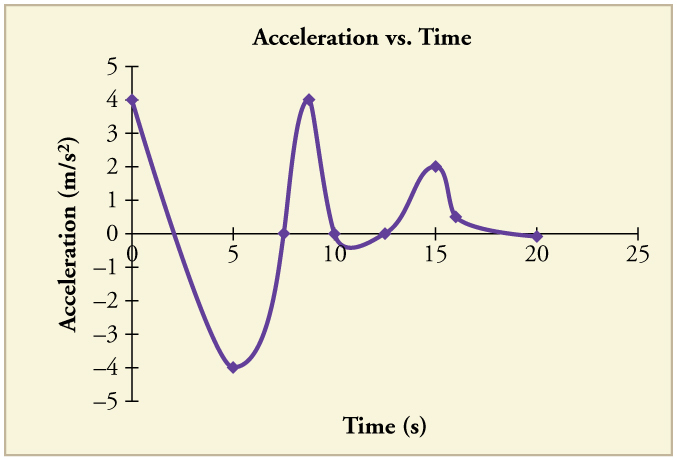 The graphs in Figure 3 below represent the motion of the jet-powered car as it accelerates toward its top speed, but only during the time when its acceleration is constant. Time starts at zero for this motion (as if measured with a stopwatch), and the displacement and velocity are initially 200 m and 15 m/s, respectively. Figure 3. Graphs of motion of a jet-powered car during the time span when its acceleration is constant. (a) The slope of an x vs. t graph is velocity. This is shown at two points, and the instantaneous velocities obtained are plotted in the next graph. Instantaneous velocity at any point is the slope of the tangent at that point. 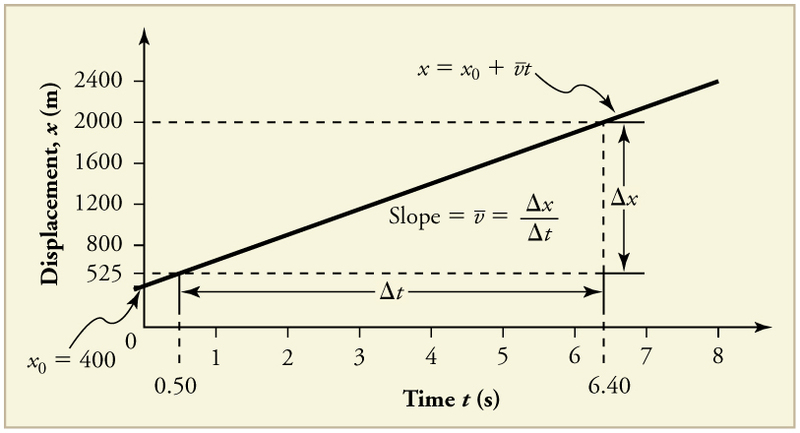 (b) The slope of the v vs. t graph is constant for this part of the motion, indicating constant acceleration. (c) Acceleration has the constant value of 5.0 m/s2 over the time interval plotted. Figure 4. 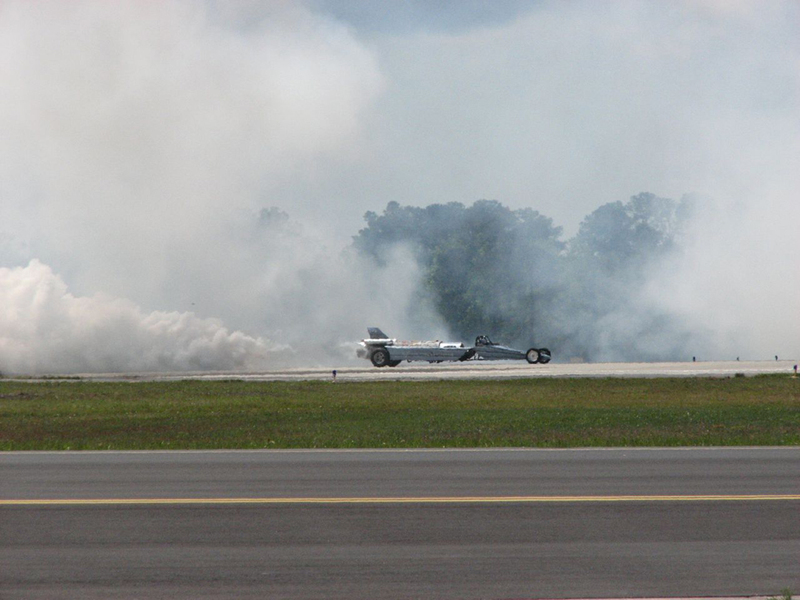 A U.S. Air Force jet car speeds down a track. (credit: Matt Trostle, Flickr). 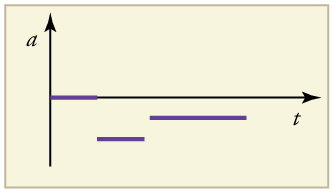 The graph of displacement versus time in Figure 3(a) is a curve rather than a straight line. 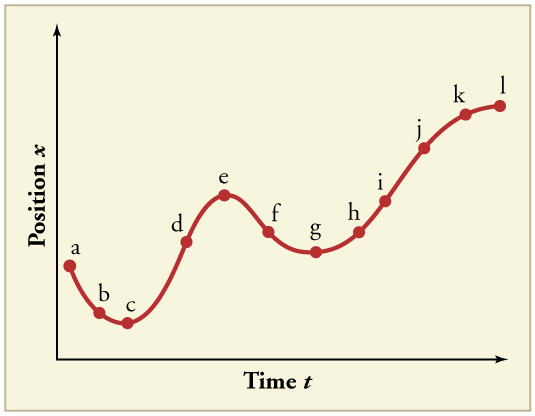 The slope of the curve becomes steeper as time progresses, showing that the velocity is increasing over time. 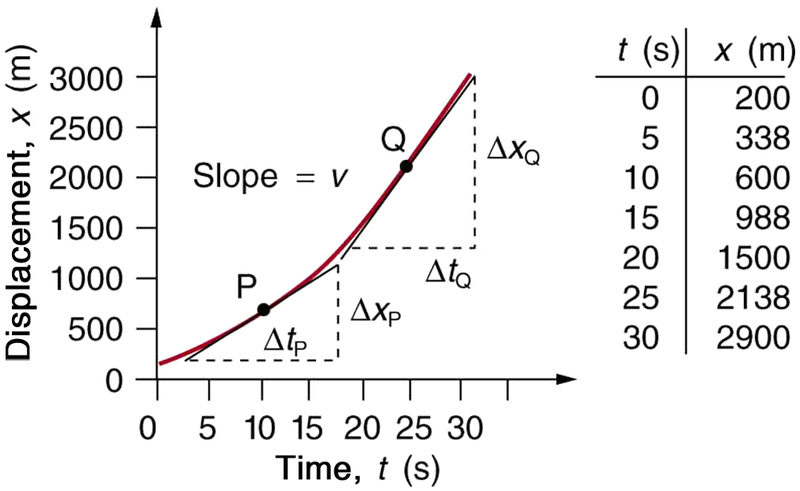 The slope at any point on a displacement-versus-time graph is the instantaneous velocity at that point. It is found by drawing a straight line tangent to the curve at the point of interest and taking the slope of this straight line. Tangent lines are shown for two points in Figure 3(a). 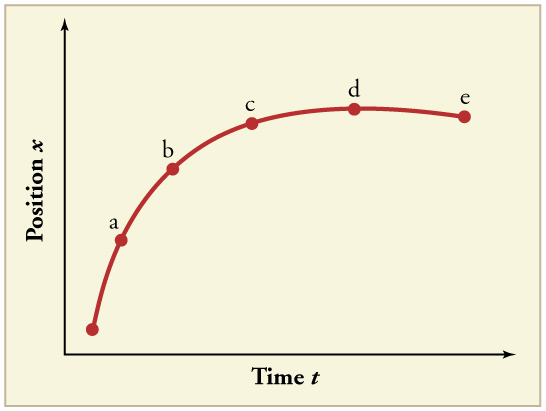 If this is done at every point on the curve and the values are plotted against time, then the graph of velocity versus time shown in Figure 3(b) is obtained. 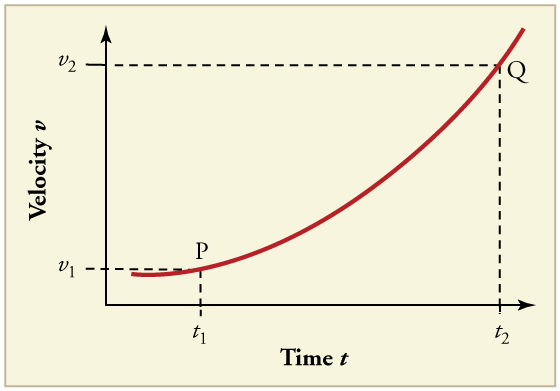 Furthermore, the slope of the graph of velocity versus time is acceleration, which is shown in Figure 3(c). 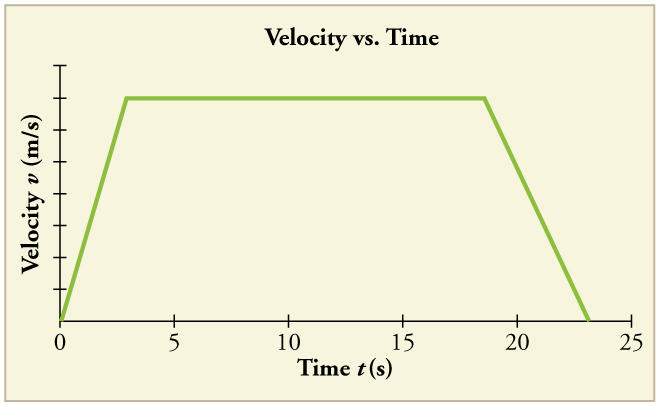 Calculate the velocity of the jet car at a time of 25 s by finding the slope of the vs. graph in the graph below. Figure 5. The slope of an x vs. t graph is velocity. This is shown at two points. Instantaneous velocity at any point is the slope of the tangent at that point. 2. Determine the endpoints of the tangent. These correspond to a position of 1300 m at time 19 s and a position of 3120 m at time 32 s.
This is the value given in this figure’s table for at The value of 140 m/s for is plotted in Figure 5. The entire graph of vs. can be obtained in this fashion. 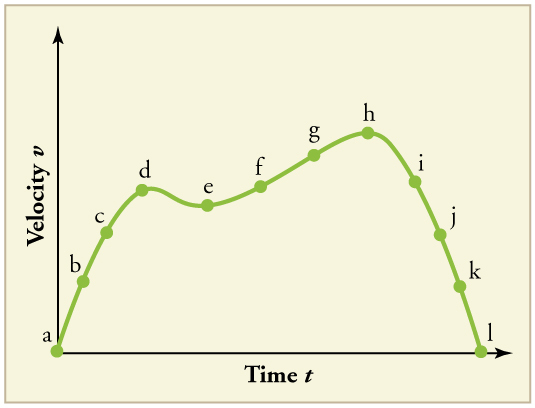 Since the velocity versus time graph in Figure 3(b) is a straight line, its slope is the same everywhere, implying that acceleration is constant. 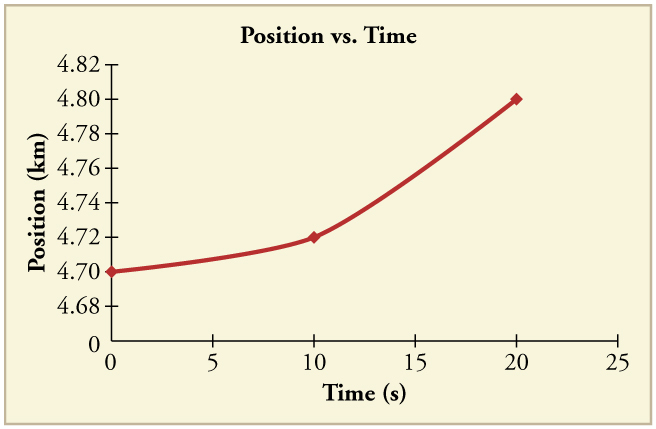 Acceleration versus time is graphed in Figure 3(c). A general relationship for velocity, acceleration, and time has again been obtained from a graph. Notice that this equation was also derived algebraically from other motion equations in Chapter 2.5 Motion Equations for Constant Acceleration in One Dimension. It is not accidental that the same equations are obtained by graphical analysis as by algebraic techniques. In fact, an important way to discover physical relationships is to measure various physical quantities and then make graphs of one quantity against another to see if they are correlated in any way. Correlations imply physical relationships and might be shown by smooth graphs such as those above. From such graphs, mathematical relationships can sometimes be postulated. Further experiments are then performed to determine the validity of the hypothesized relationships. Now consider the motion of the jet car as it goes from 165 m/s to its top velocity of 250 m/s, graphed in Figure 6. Time again starts at zero, and the initial displacement and velocity are 2900 m and 165 m/s, respectively. (These were the final displacement and velocity of the car in the motion graphed in Figure 3.) Acceleration gradually decreases from to zero when the car hits 250 m/s. The slope of the vs. graph increases until after which time the slope is constant. Similarly, velocity increases until 55 s and then becomes constant, since acceleration decreases to zero at 55 s and remains zero afterward. Figure 6. 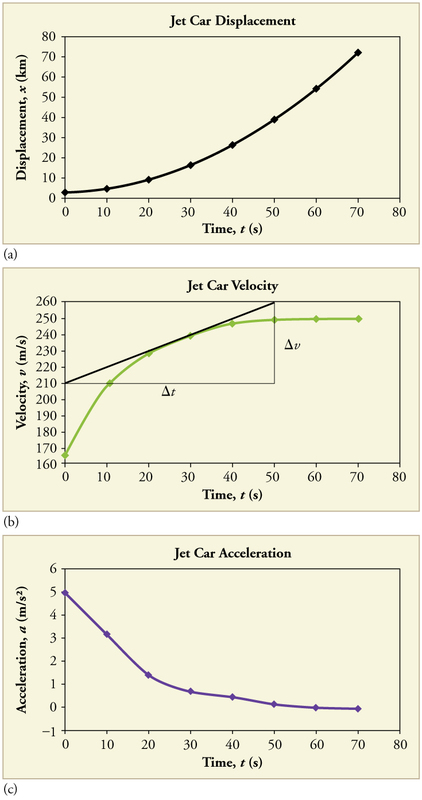 Graphs of motion of a jet-powered car as it reaches its top velocity. This motion begins where the motion in Figure 3 ends. (a) The slope of this graph is velocity; it is plotted in the next graph. (b) The velocity gradually approaches its top value. The slope of this graph is acceleration; it is plotted in the final graph. (c) Acceleration gradually declines to zero when velocity becomes constant. Calculate the acceleration of the jet car at a time of 25 s by finding the slope of the vs. graph in Figure 6(b). 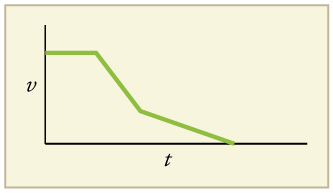 The slope of the curve at is equal to the slope of the line tangent at that point, as illustrated in Figure 6(b). 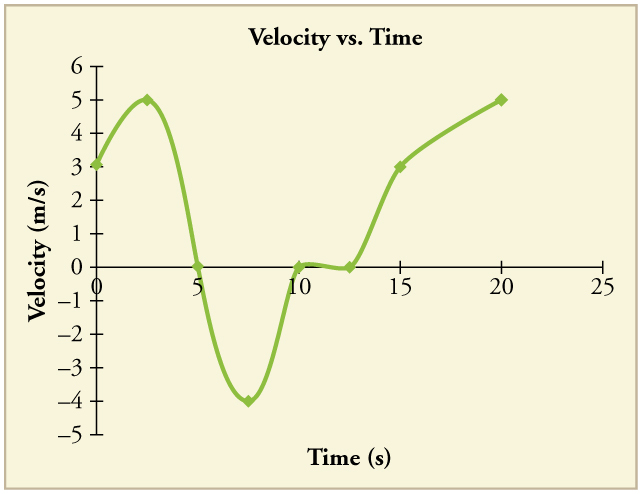 A graph of displacement versus time can be used to generate a graph of velocity versus time, and a graph of velocity versus time can be used to generate a graph of acceleration versus time. We do this by finding the slope of the graphs at every point. If the graph is linear (i.e., a line with a constant slope), it is easy to find the slope at any point and you have the slope for every point. Graphical analysis of motion can be used to describe both specific and general characteristics of kinematics. Graphs can also be used for other topics in physics. An important aspect of exploring physical relationships is to graph them and look for underlying relationships. 1: A graph of velocity vs. time of a ship coming into a harbor is shown below. (a) Describe the motion of the ship based on the graph. (b)What would a graph of the ship’s acceleration look like? 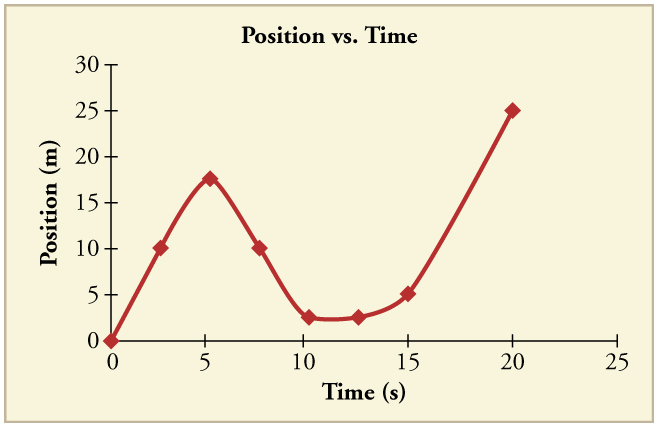 Graphs of motion can be used to analyze motion. Graphical solutions yield identical solutions to mathematical methods for deriving motion equations. Average velocity, instantaneous velocity, and acceleration can all be obtained by analyzing graphs. 1: (a) Explain how you can use the graph of position versus time in Figure 8 to describe the change in velocity over time. Identify (b) the time ( ) at which the instantaneous velocity is greatest, (c) the time at which it is zero, and (d) the time at which it is negative. 2: (a) Sketch a graph of velocity versus time corresponding to the graph of displacement versus time given in Figure 9. (b) Identify the time or times ( etc.) at which the instantaneous velocity is greatest. (c) At which times is it zero? (d) At which times is it negative? 3: (a) Explain how you can determine the acceleration over time from a velocity versus time graph such as the one in Figure 10. (b) Based on the graph, how does acceleration change over time? 4: (a) Sketch a graph of acceleration versus time corresponding to the graph of velocity versus time given in Figure 11. (b) Identify the time or times ( etc.) at which the acceleration is greatest. (c) At which times is it zero? (d) At which times is it negative? 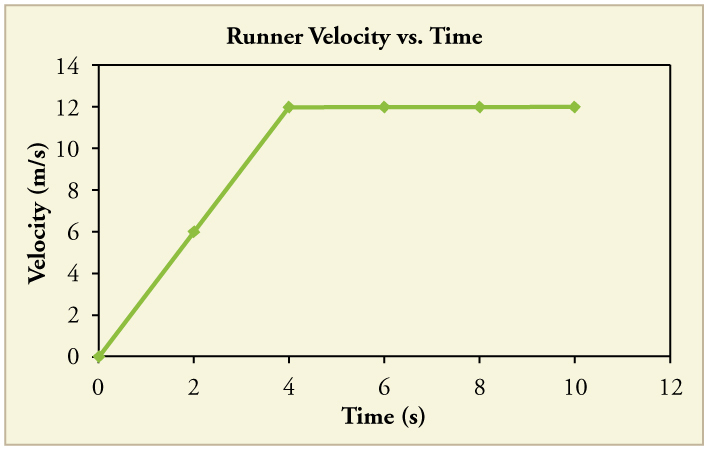 5: Consider the velocity vs. time graph of a person in an elevator shown in Figure 12. Suppose the elevator is initially at rest. It then accelerates for 3 seconds, maintains that velocity for 15 seconds, then decelerates for 5 seconds until it stops. The acceleration for the entire trip is not constant so we cannot use the equations of motion from Chapter 2.5 Motion Equations for Constant Acceleration in One Dimension for the complete trip. (We could, however, use them in the three individual sections where acceleration is a constant.) Sketch graphs of (a) position vs. time and (b) acceleration vs. time for this trip. 6: A cylinder is given a push and then rolls up an inclined plane. If the origin is the starting point, sketch the position, velocity, and acceleration of the cylinder vs. time as it goes up and then down the plane. Note: There is always uncertainty in numbers taken from graphs. If your answers differ from expected values, examine them to see if they are within data extraction uncertainties estimated by you. 2: Using approximate values, calculate the slope of the curve in Figure 15 to verify that the velocity at is 0.208 m/s. Assume all values are known to 3 significant figures. 3: Using approximate values, calculate the slope of the curve in Figure 15 to verify that the velocity at is 0.238 m/s. Assume all values are known to 3 significant figures. 5: Construct the displacement graph for the subway shuttle train as shown in Chapter 2.4 Figure 7(a). 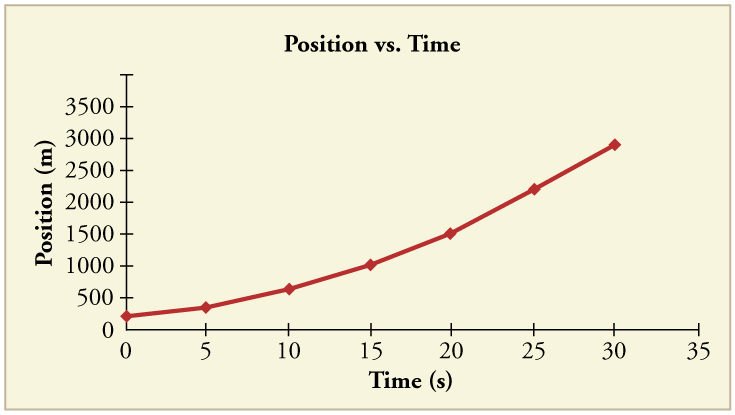 Your graph should show the position of the train, in kilometers, from t = 0 to 20 s. You will need to use the information on acceleration and velocity given in the examples for this figure. 6: (a) Take the slope of the curve in Figure 17 to find the jogger’s velocity at (b) Repeat at 7.5 s. These values must be consistent with the graph in Figure 18. 7: A graph of is shown for a world-class track sprinter in a 100-m race. (See Figure 20). (a) What is his average velocity for the first 4 s? (b) What is his instantaneous velocity at (c) What is his average acceleration between 0 and 4 s? (d) What is his time for the race? 8: Figure 21 shows the displacement graph for a particle for 5 s. Draw the corresponding velocity and acceleration graphs. 1: (a) The ship moves at constant velocity and then begins to decelerate at a constant rate. At some point, its deceleration rate decreases. It maintains this lower deceleration rate until it stops moving. (b) A graph of acceleration vs. time would show zero acceleration in the first leg, large and constant negative acceleration in the second leg, and constant negative acceleration. 2.8 Graphical Analysis of One-Dimensional Motion by OpenStax is licensed under a Creative Commons Attribution 4.0 International License, except where otherwise noted.